I have to say, I have a lot of interests in life.. and I love to learn about new things.. in some ways I wish I was *not* like this, because life can get pretty chaotic when you have many projects and interests going all at the same time. But Art has always been at the top, drawing, painting and other artistic expressions. Unfortunately I have always felt very intimidated by that old Nemesis of many artists. The BLANK canvas. But, I have found a new area that is interesting and quite wonderful, Altered art and altered books, Mixed media, and collage. Especially the format of ATC cards, or artist trading cards. The only stipulation for an ATC is that it be 2.5 by 3.5 inches. Other than that it can be made in any medium. I have seen so many very very beautiful and inspired cards and art in the last few months.. I am absolutely blown away by the diversity and how wonderfully varied these little pieces of art can be made. So I finished my first card the other day, and it's very simple.. but it made me giggle... 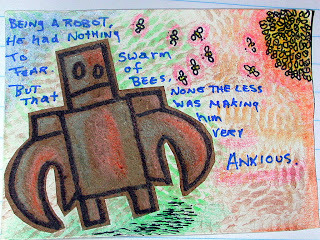 I incorpereated a hand drawn little robot that I found on Etsy.. There is a shop by a lady who goes by Spidercamp, who makes the most Hilarious "bunnies that swear" very cute soft fleece little stuffed bunny ornaments, some of which have naughty words embroidered on their tummies! She also makes some "Bunnies of purity" and great cat toys. Her wonderful creations can be found at http://www.spidercamp.etsy.com/ She also has another shop http://www.jessicapierce.etsy.com/ in which she stocks odd and ends of various items, sewing things, fabrics (I found some nice fabric for my quilting ) and bits and bobs good for art and Collage and mixed media, in her own words some "weird things" I love to peruse her shop as I never know what neat or strange odd little item I might see. Last month she had a listing for some of her hand drawn little robots on kraft paper, various sizes, I had to get them , they just made me laugh. And when I received them I had to fight for my little treasures as my daughter spied them and she thought they were grand! She has this thing about Robots.. they kind of scare her and fascinate her at the same time. She has Down Syndrome and is borderline mild autistic so she gets fixated on certain things. So With that I post for your consideration my Very First (albeit quite simple) ATC! Which deals with MY very ** real terror** of Flying Stingy things! I am going to be creating a series using Jessicas Robots that I will list in my shop but the first one I am keeping forever! If anyone would like to know more about artist trading cards and their history, or how to make artist trading cards, they may also be interested in a couple of articles that I've written. There's also some information on how to swap artist trading cards.